With the Walk Bike Ride (WBR) challenge underway*, the City is now releasing an update on the standings in the neighborhood competition. As of the most recent update on July 25th, Ballard holds a commanding lead, with West Seattle and Capitol Hill a distant second and third. According to the City, a total of 2285 vehicle miles have been saved by neighborhood participants, amounting to a conservation of more than 3272 100 gallons of gasoline. 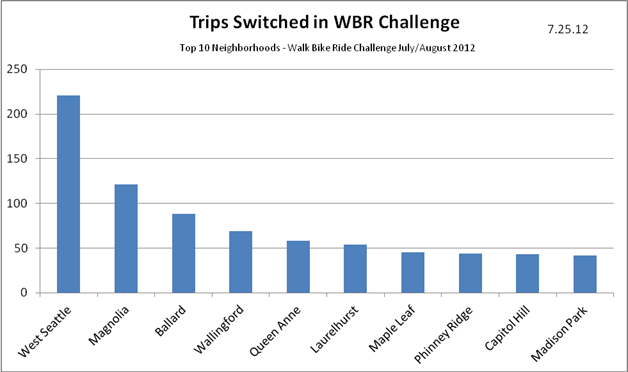 Interestingly enough, West Seattle is the neighborhood leading the pack when it comes to the number of trips saved thus far, which seems to indicate that the converted trips out of Ballard are much lengthier distance-wise. I can’t find a rational explanation for this peculiarity other than the presumption that Ballardites are more likely converting longer-distance commute trips rather than shorter errand-type trips. This map from SDOT shows where the neighborhoods stand with regard to car miles saved. Here’s more info on the July/August competition. If you sign up you’ll receive weekly emails with encouragement and tips, and for every trip you switch you earn a chance to win some great prices, like an electric bike, a one night stay at the Pan Pacific Hotel and more. There are five weeks left in the neighborhood competition, so these neighborhoods could move up or down in the rankings. The Seattle Walking Map and the Seattle Bike Map can help you take advantage of everyday opportunities to get exercise as you get around. *My last WBR post mistakenly encouraged those already regularly WBR’ing to sign up, although the purpose of the challenge is for the conversion of auto trips, not existing WBR trips. I walk from Fremont to the U Dist 1-2 times a day. How does 2285 vehicle miles saved possibly equate to 3272 gallons of gas? That’s less than a mile per gallon (the linked page makes similar claims – smaller numbers, but about the same ratio). And how does 2285 miles saved in a month for an entire city equate to any kind of success? If a typical trip is 5 miles, you’ve saved all of 230 round trips. Total. For the whole city. In a time span of more than a month. So, say this is 25 working days. That means about 8 people per day, in a city with 600k+ people, chose to go via an alternate route? I was wondering the same thing. In reality I think these are just the people who know about the program and are making a point to log their results. I personally don’t own a car so I suppose I’m not really “converting” any trips, but I don’t see that as a failure to meet the spirit of WBR. Frankly I just don’t think this system is particularly well-designed – the best way to get people to switch is to offer them transportation alternatives that are truly time- and convenience-competitive with their existing auto trips. I see the main goal of this program and programs like it being to get people to try W/B/Ring, and then hopefully discovering that it’s much better than they expected. It took moving to Seattle at about the same time that my car had broken down to discover that for myself, and I think a lot of people are in a similar situation of needing a very strong incentive or lacking any other choice before giving it a chance. Good question, I’ll send a query to SDOT.